One day in 1999 my older sister, Mildred, called. She had found a breast lump, and was scheduled for day surgery. I scheduled a day off work to be with her, though her adult son and daughter would be there, too. Mildred has an especially close bond with her grandson Jacob, having kept him often since infancy, sometimes for weeks at a time. I knew Mildred would want him with her. The night before, I told her, “He’s only 5. The hospital’s no place for him. He’s a good kid, but he’ll get tried and cranky before the day’s over. Please leave him at home. I knew the battle was lost. It wasn’t Jacob’s mother Ginger who wanted Jacob, it was Mildred. Sure enough, when I arrived at the hospital, Jacob was there. Thankfully, my niece had come just to play with Jake. Though irritated by his presence, I admitted he was quiet and easy to entertain, and he definitely took Mildred’s mind off the upcoming surgery. Sister, son, daughter, niece, and grandson packed books and toys and trooped behind the nurse and Mildred to her room. Mildred’s vitals were taken as the adults stood and Jake played quietly. We stepped out as she changed into a gown. When we returned, Mildred was in bed with an IV connected to her arm. Jake was very concerned; his great-grandfather had recently stayed in the hospital and died there. Was Granny going to die? During the surgery our entourage moved to the cafeteria, then the day surgery waiting room to await the doctor’s report. By now Jacob had been at the hospital six hours and was still incredibly well-behaved. I was impressed. Finally the doctor gave his report: the lump was benign. “That’s right! You’re a smart boy.” she replied. Then, “Mildred, this tape is really stuck. I’ll try to be gentle, but this may hurt.” Suddenly all adult conversation stopped, as the nurse asked, “What is he saying? I can’t quite hear him.” We all strained to hear Jake. “He’s singing to me,” Mildred explained. Then we all hear it. 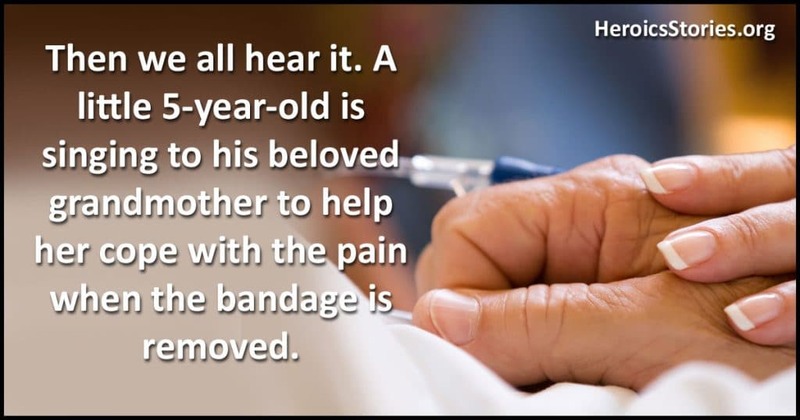 A little 5-year-old is singing to his beloved grandmother to help her cope with the pain when the bandage is removed. One look at their faces and you know he is singing her a love song. Thank for running my story again. It describes one of my favorite memories and to me it was almost a holy moment. Jacob is now twenty and he and Mildred are still very close. The idea of a 5-yr.-old solemnly singing “E-I-E-I-O” as his grandma has her bandage removed had me both on tears and laughing! Thank you! It’s hard to laugh and sob at the same time but, somehow, that’s what I did when I read Jacob’s love song!